White Hamilton Beach 86650 is an automatic electric noodle and pasta maker with a 1.5 lb. capacity and 7 different discs. You can make fresh homemade pasta within just around 15 minutes. It is a fully automated machine that mixes and kneads the dough and extrudes pasta. 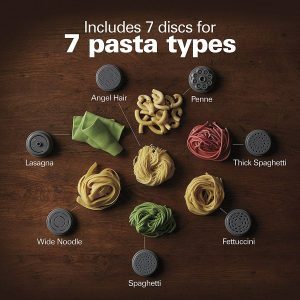 You will get discs for 7 different noddle shapes with this machine for making wide noodle, fettuccini, spaghetti, penne, lasagna, thick spaghetti, and angel hair. You’ll find a convenient built-in storage drawer in this noodle maker to put your discs in. After the noodles are extruded you do not need to dry the pasta and you can use it immediately in your boiled water. So you won’t be losing any time for drying pasta. There is a scale inside that weighs all the ingredients and calculates the optimal flour to water ratio to tell you how much water you need to add, based on the amount of flour and to make the best pasta. You can try and make spinach pasta or gluten-free pasta by customizing the ingredients- flours, vegetable juices and purees. You simply put the ingredients in and and press the Start button to make a pound of fresh and tasty pasta quickly. 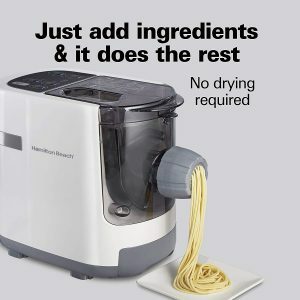 You’ll be able to make pasta with four easy steps with this pasta maker: First you add the flour (any flour type of your choice), select Quick Pasta or the regular pasta noodles, add the amount of liquid that the digital display tells you to, and the machine will mix your ingredients, knead the dough to get the right consistency and extrude the pasta within only ten to fifteen minutes. You put your pasta in the boiling water for just a few minutes and enjoy it. You can add beet, spinach, carrot or other veggie juices, ginger, chili peppers and other spices, olive oil, eggs and different types of flours to make pasta with different flavors. It is actually quite nice to be able to experiment with all the different ingredients. In the box you’ll find the electric pasta noodle maker, 7 pasta discs, flour and water measuring cups, a cleaning tool and four recipes with tips. You’ll be able to make great homemade pasta or noodles much easier and faster and making as little mess as possible. White Hamilton Beach 86650 weighs 11.42 pounds and measures 13.31H x 9.65L x 17.72W inches. It can have a permanent spot on your kitchen counter if you’ll be making pasta frequently or store it away easily. As a rough guide you need about 135ml of water for one pound of flour and 200ml for 1.5 pounds of flour. If you like using eggs, you probably know they add a smooth texture and richer flavor to your pasta. You may want to lightly flour the noodles as it comes out of the machine, so there is no sticking. Adding a few ml of oil with the liquid will make your pasta smoother and some salt will make it chewier. If you see the error messages with codes like E02, E04, E14, E16 etc. please refer to the table on the user manual to resolve the matter quickly. You’ll get one year of limited warranty in the US and five years in Canada from the date of purchase as well as decent customer support by Hamilton Beach and the free Amazon technical support. Overall for the features, user-friendliness and build quality Hamilton Beach Pasta Maker is good value for money.